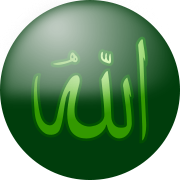 Focal Araibise é al-islam(الإسلام). Is é is bunús leis an bhfocal seo ná an fhréamh thríchonsanach slm a chiallaíonn "géilleadh", is é sin, go ngéilleann an duine é féin do Dhia go suaimhneach, gan dul chun diúnais Air. Is é an Muslamach, nó muslim, an duine a chleachtann an cineál seo géillte - an "géillteoir". Mar sin tá dhá bhrí ag ceachtar den dá fhocal seo: ciallaíonn siad an creideamh Ioslamach atá bunaithe ar an teachtaireacht a nochtadh do Mhuhammad, agus an duine a leanann an creideamh sin. Ach ciallaíonn siad fosta an géilleadh do Dhia, an t-adhradh agus an urraim is cuí a thabhairt Dó agus Dá chuid orduithe. Na fáithe a tháinig roimh Mhuhammad, ar nós Íosa agus na bhfáithe Giúdacha, áirítear mar Mhuslamaigh iad freisin, ó ghéill siad do Dhia. Sa chiall leathan, is Muslamaigh iad na hainmhithe agus na plandaí, ó tá an cineál saoil acu a d'ordaigh Dia dóibh. Nocht Dia (Araibis: Allah) A theachtaireacht naofa tríd na fáithe, ar a n-áirítear, Ádhamh, Abrahám, Naoi, Maoise, Íosa agus Muhammad. Cuireadh an teachtaireacht seo go díreach isteach sa Chóran, agus mar sin is leabhar iomlán gan bhotún é; de réir an Ioslaim cheartchreidmhigh, is é an Córan friotal Dé a bhí ann roimh an gcruthú féin. Is é an tuairim choitianta i measc na Muslamach gur thruailligh na daoine an teachtaireacht sa Bhíobla Chríostaí agus i dTóra na nGiúdach, agus mar sin, gur nochtadh an Córan mar theachtaireacht nua iomlán lánchuimsitheach. Cré an Ioslaim (shahada): Níl de dhia ach Dia, agus is é Muhammad A theachtaire. Na hurnaithe laethúla (salah): caithfidh gach Muslamach a urnaithe a dhéanamh de réir scéim righin. An déirc (zakat): caithfidh gach Muslamach déirc a íoc leis na bochta is na nochta. An troscadh (sawm) le linn na míosa úd ramadan i bhféilire an Ioslaim. An oilithreacht go Meice (hajj). Tá cuid mhaith seicteanna difriúla san Ioslam. Is é an Sunnachas an tseict is mó; fórmhór Mhuslamaigh an domhain, is Sunnaigh iad. Is é an Sítheachas an dara leagan is mó den Ioslam, agus é féin deighilte ina sheicteanna éagsúla. Bunús na scoilte, eascraíonn sé as ceart comharbachta an Fháidh Muhammad; de réir na Sítheach, ba chóir ball de theaghlach Muhammad a theacht mar chomharba air. San idirlinn, d'fhorbair difríochtaí suntasacha sna deasghnáthaí idir an Sunnachas agus an Sítheachas freisin, ach aontaíonn an dá dhream ar phríomhcheisteanna an chreidimh. Tá lucht leanúna an tSítheachais ina bhformhór i measc Mhuslamaigh na Liobáine, na hIaráice, na hIaráine, agus Bahrain; agus tá mionlaigh thábhachtacha Shítheacha sa Phacastáin, in Éimin agus sa tSiria freisin; sna tíortha eile, is iad na Sunnaigh an dream is líonmhaire sa chuid eile den domhan Ioslamach. Tugadh an leathanach seo cothrom le dáta an 3 Samhain 2017 ag 13:46.